-_- Thought the hand drawn handphone was funny lei. Eh which phone are you using again? 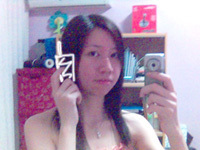 Hehehe.. I’m using the Sony Ericsson k700i. Meh, I want your phone.. so few Bluetooth phones out there that I really like. ‘Cos I want a camera phone that can sync painlessly to my lappie. And that isn’t fugly. You think I got sugar daddy ah.. -_- My Singtel line is due for upgrade in May, already told Dad which phone I want. Hur hur. And it’s only $198 on two year plan!